This King chess piece is called as Edelweiss type. Why it call Edelweiss? Because the color of this kind of chess piece is not original white, but looks like Edelweiss color. So that this chess piece categorized in Edelweiss chess type. As the picture show, we give you an example of Edelweiss chess piece. It is the King stand alone with its heroic character and polished different with other ordinary King piece. The product above has made from best quality of Teak wood that has dried. Very durable for outdoor and indoor use. You do not need to worry about its damaged because it has made from the strongest wood in the world. So you can left it outdoor for days or months. 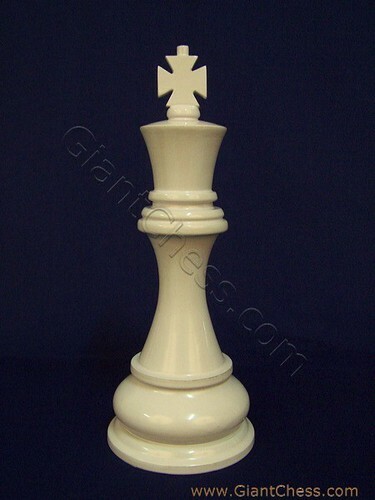 Beside use for chess game, the chess piece also perfect for house decoration. You can decorate your living room or your children room with this kind of chess. It will so interesting and give unique touch in your house.